"Assault!". Full Cycle: Part 1 of 4. Slade Wilson is a super-soldier who uses 90% of his brain's capacity and this has allowed him to build a reputation as the best there is. Story by Marv Wolfman. Appearance: Deathstroke. Writer : Marv Wolfman. Title: The New Titans. Story Arc: War of the Gods. Artist : Curt Swan. Date : Dec, 1991. Issue : 81. Condition Range: Fine/VF. Full Cycle: Part 1 of 4. "Assault!". Story by Marv Wolfman. Art by Steve Erwin and Will Blyberg. Cover by Mike Zeck. Slade Wilson is a super-soldier who uses 90% of his brain's capacity and this has allowed him to build a reputation as the best there is. "Assault!". Full Cycle: Part 1 of 4.2nd Print- Gold cover. Slade Wilson is a super-soldier who uses 90% of his brain's capacity and this has allowed him to build a reputation as the best there is. 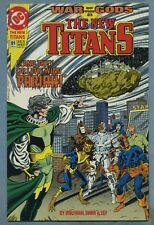 Story by Marv Wolfman. 1st App of SOLO Deathstroke. BATMAN MOVIE COMING SOON TO FEATURE HIM AS VILLAIN . In plastic bag and boarded. Item in picture is of real and actual item. Canada and. Grade: VF 8.5. Published 1991 by DC. This is a mid grade item. It will have a few minor defects and will generally appear to be in "slightly used" but not "roughly used" condition. Defects allowed on an item in this grade may include minor corner wear (bends and blunting), small/light accumulation of dents, bends or folds, and light spine wear. Full Cycle: Part 2 of 4. "Kidnaped!". Story by Marv Wolfman. Art by Steve Erwin and Will Blyberg. Cover by Mike Zeck. They hospitalized his ex-wife. They tried to kill him and destroy everything he had. Full Cycle: Part 4 of 4. ".Bombs Bursting in Air!". Story by Marv Wolfman. Art by Steve Erwin and Will Blyberg. Who is this mysterious killer who has taken up the moniker of Slade's fallen son?. Most collectors consider both versions to be of equal value. of comics, generally about 25-40 comics depending on page count. Published 1991 by DC. "Revelations and Revolutions!". Story by Marv Wolfman. Full Cycle: Part 3 of 4. Story by Marv Wolfman. Art by Steve Erwin and Will Blyberg. Cover by Mike Zeck. These two super-soldiers throw-down in one of the most vicious brawls ever put on paper. Most collectors consider both versions to be of equal value. BOOK IS A CBCS SIGNATURE SERIES GRADED 8.0! IT HAS BEEN SIGNED BY GEORGE PEREZ, MIKE ZECK, AND MARV WOLFMAN! SUPER HARD TO GET ALL THREE! This is normal in our experience. NOTE: We don't grade any raw books higher than 9.2, as once you go higher than that grading gets really subjective. Is the item pictured the exact one for sale?. The price may vary based on size, weight, and location. The Comics Pictured are the comics sold. I frequently run promotions so if you buy more than one item you can get up to 25% off the buy it now prices. 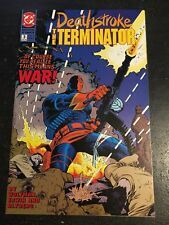 Deathstroke,The Terminator#1 Awesome Condition 7.5(1991) Mike Zeck Cover!! 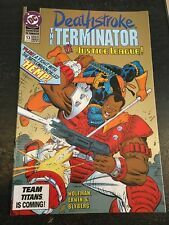 Deathstroke The Terminator#3 Incredible Condition 8.5(1991) Mike Zeck Cover!! 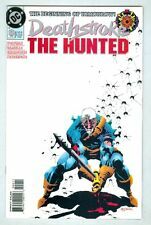 Deathstroke:The Terminator#28 Incredible Condition 8.0(1993) Zeck Cover!! 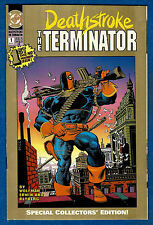 Deathstroke,The Terminator#30 Awesome Condition 7.5(1983) Cool! !